Soloists: Leila Benn Harris, Helen Hobson, Michael Xavier and Scott Davies will be accompanied by Scottish Festival Orchestra and the City of Glasgow Chorus. Conductor: John Owen Edwards. 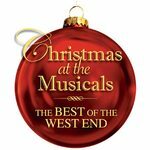 Show-stopping numbers from the greatest West End and Broadway musicals including Love Never Dies, The Phantom of the Opera, Les Misérables, Chicago, My Fair Lady, Wicked! and many, many more. The four soloists are also appearing in a third concert, this time at the Nottingham Royal Concert Hall on Thursday 15 December 2011 at 7.30pm. Thanks for that. Have already written the blog for Nottingham but was going to wait until tomorrow to post it. You can have too much of a good thing! Personally I can never have too much of either West End International or indeed of this great site! :-) Thank you! You're very kind. Michael's Nottingham Concert now posted. The wonderful Helen Hobson is now scheduled to take the place of Jenna Lee James at these concerts. Thanks for that Gregor. Have updated post and also tweeted change.